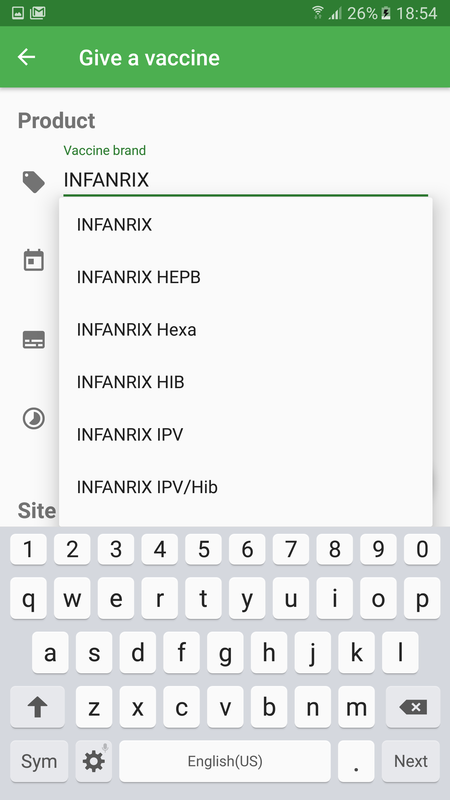 Vaxini displays in one single view all vaccine doses you have received for a given disease. 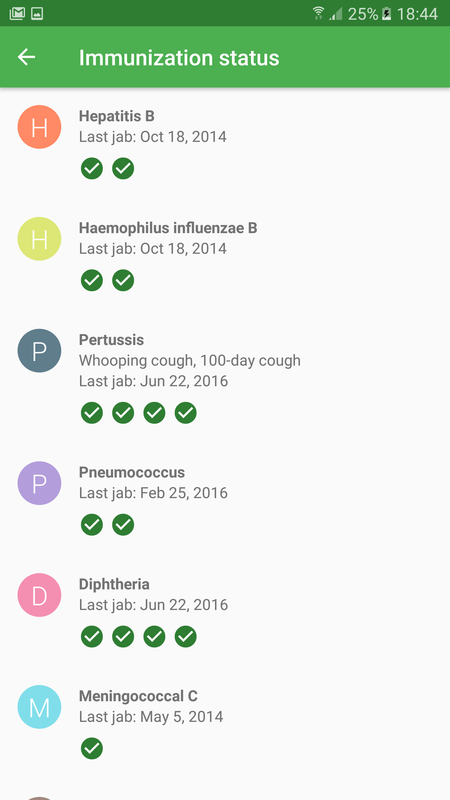 When you visit your doctor or pediatrician, you can easily know when the last vaccine dose has been applied. Each green bullet represents one dose of an immunizational product. Diseases include the colloquial names of diseases. The timeline presents a calendar view. Both past and future suggestions are displayed, together with the shots the user has received. The round number represents the dose you received for a certain disease. The information is grouped in cards. 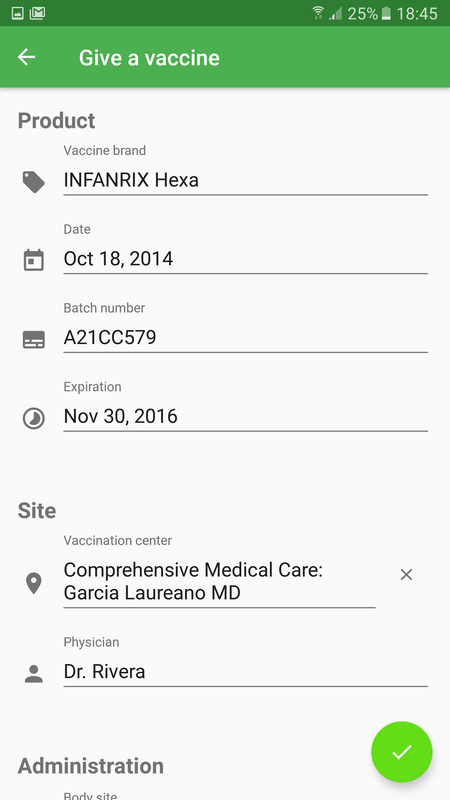 When you give a jab, a card is generated, including data such as product trade name, vaccination center with interactive map, physician’s data, signature and stamp, vaccine label (sticker), funding information. You can also track side effects, problems, hindered activities, medical interventions required, etc. A click on the items in this view leads the user to the proper information in real time. Each user in Vaxini has a separate profile, thus making it possible to track user’s in different countries. We support schedules for 200 different countries around the world, including the suggestions of local health authority and the World Health Organization. You can also call the emergency service and get suggestions on how to recognize a vaccine adverse event or serious reaction. 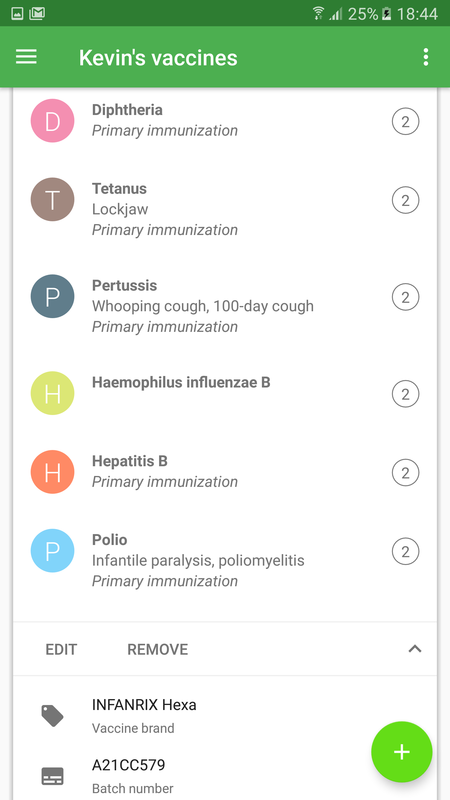 Extensive information about vaccines are also included in the app. 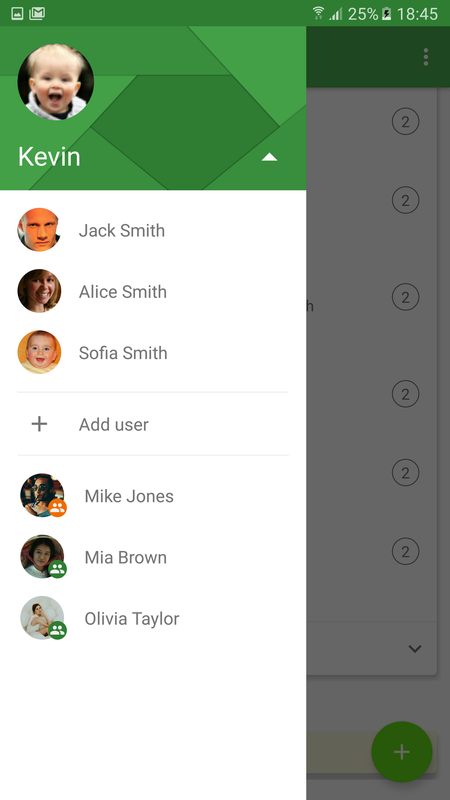 You can configure as many users as you need. People use Vaxini to keep records of the family. Organizations like kindergartens and schools also use Vaxini to track compliance to immunizational requirements. 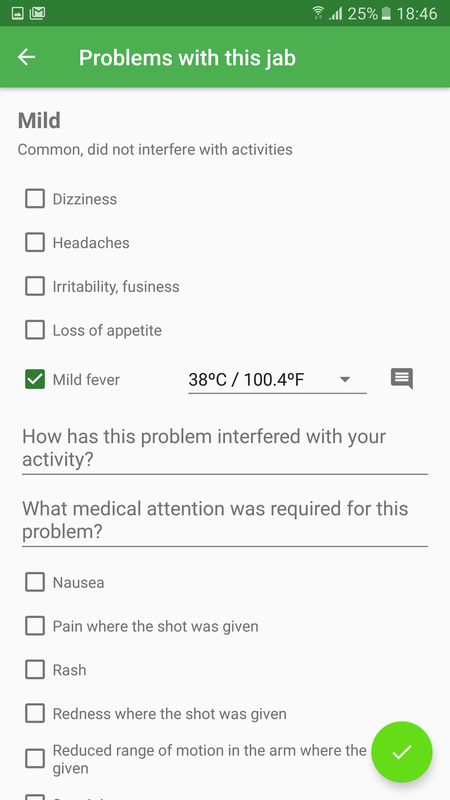 Physicians can also enter vaccination information in the user profiles. It’s as easy as sharing the user’s profile with your physician. 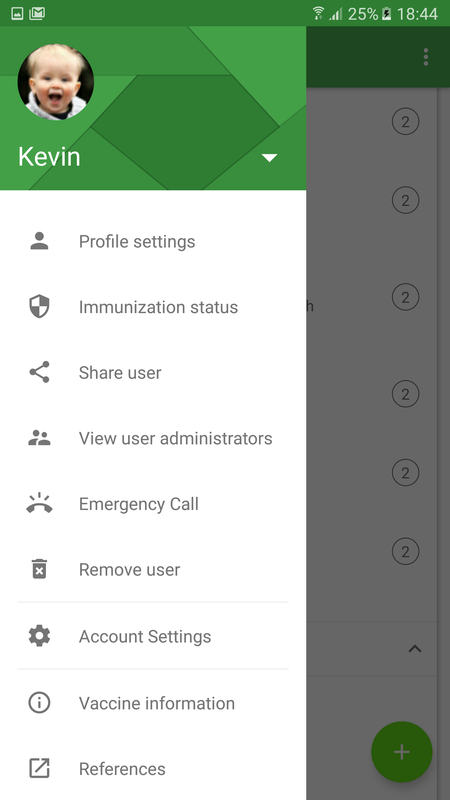 The lower portion of the screen shows all users you can access, either as an administrator (e.g. your doctor or your spouse) or as a read only user (e.g. school). Each time you or your kids gets a vaccine, you enter the product trade name, the date of vaccination, the batch number and expiration date of the vaccinational product, the vaccination center (interactive map), the physician’s name, antibody titers, body part, administration route, funding information, problems and reactions, etc. You should also make a picture of the whole record in paper, so that you always have it at hand. Vaxini stores this info in our private cloud, so that it can be always recovered when you change your device. For each shot you get, you are able to report side effects, hindered activities and medical interventions required. 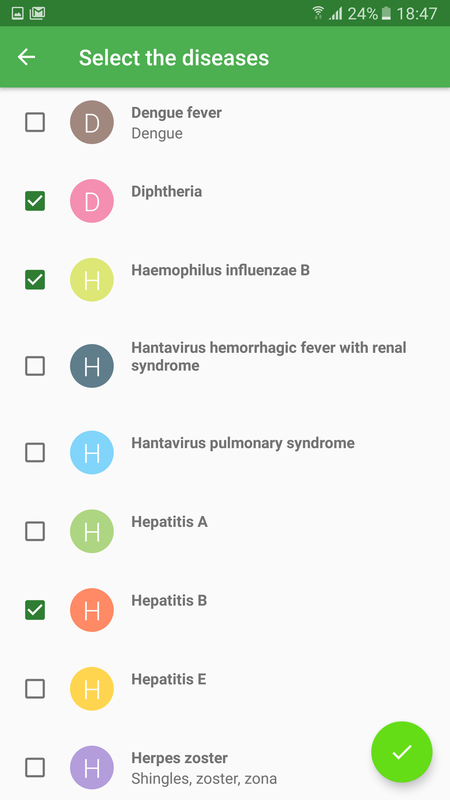 Known problems for each vaccine type are auto-suggested, so that you know if the problem you experienced is known or a new one. Information about the severity and the frequency of occurrence is included. Vaxini tracks vaccinational products since 1943. We have more than 2,000 products in our database and keep updating and reviewing records in order to improve the data quality of your input. Vaccines undergoing clinical trials can also be found in Vaxini. If your immunization records or card do not detail the tradename of the product given in a jab, you can also track your immunization profile entering the diseases for which you got a vaccine. More than 60 diseases can be tracked by Vaxini.